Brooklyn DA's new real estate crime unit head vows to "fill the cells"
The Brooklyn District Attorney’s office just secured funding to start a new Real Estate Fraud Unit that will investigate everything from mortgage fraud to the recruitment of straw home purchasers. On this week’s Webcast, The Real Deal’s Jill Gardiner goes inside to talk to the new chief of the unit, Richard Farrell. He said mortgage fraud, deed fraud, and all other real estate crime is a “runaway train” in the borough. 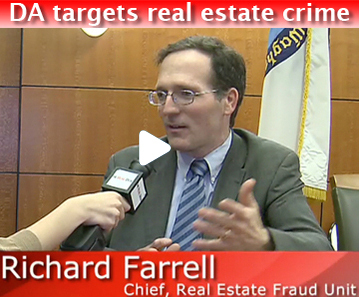 Farrell said the real estate boom followed by the current downturn has created a ripe environment for real estate scammers to prey on victims who are desperate to refinance or get rid of their homes. He said his 12-person staff would sift through old cases and has already received tips on new ones, which he vowed to aggressively pursue. “What I said to my direct boss, the head of the [Racketeering] Unit, was give me the bodies, meaning the workers. I’ll fill the cells.” To watch the full Webcast, click on the video below.